It must be the season. Spring is the time of new beginnings. Mine has included the beginnings of sock designs. The first was such a success that I couldn't wait to make a pair for myself. However, thrilling as it was and as pleased as I was that it was successful, I soon learned that because I'd shared it here, the design couldn't be submitted elsewhere as "new" (watch for the pattern to appear in the sidebar later in the week). High from the design experience, when I attempted to knit a pattern that wasn't working, I decided to give it another go. Unfortunately, the yarn did not want any of the stitch patterns that I threw at it. Anything fancy and the yarn would "spit up" and pool all over the place. It looked best with plain stockinette and standard ribbing. They are plain (to knit) but plain really shows off the yarn. Sometimes you have to let the yarn win and get its way. Sometimes you have to listen to what it says. Sometimes, the simplest things are the most beautiful. But, now I am still itching to come up with another design to submit. Back to the drawing board! My baby (Panda) turned 16 today. I can't believe it! SIXTEEN! We completely surprised her. We told her that her Dad needed us to run an errand and pick up a new windshield...she assumed it was for his Harley (even though we were at a Honda dealer). 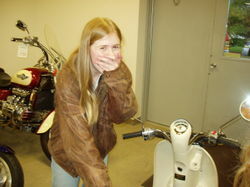 While we were filling out forms, she was looking at a new helmet for when she rides awith Doogie. 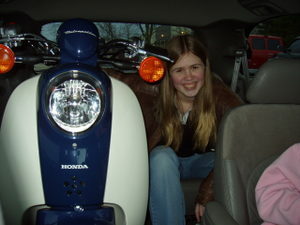 She was totally surprised when she walked up to the counter and I handed her the keys to her own scooter! They went through everything with her. Unfortunately, winter has returned (along with rain) so she didn't get to take it for a spin. Under Doogie's arm IS a windshield. It just happens to be hers! 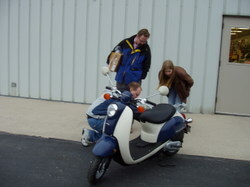 But since we were putting the scooter in the van to take it home, we asked them not to put the windshield on. BTW: The leather jacket is the one Doogie wore when Panda was a baby/toddler/"peanut". The shoulders have some pretty interesting "weathering" from baby spit and a toddler's grip with food covered fingers. We tease Panda and say that the jacket belongs to her because it's infused with her DNA! The tell-tale blush from ear to ear tells me that we COMPLETELY surprised her. She has "baby" home. It's name, for now, is Blue/Bloo (sp?). All I know is that at 100 mpg, Mom's Taxi will be breathing a sigh of relief in a very short time. Hmmm, will lower gas expenses mean a rise in stash!?! Nah, I don't like to have much stash laying around...and remember, sock yarn doesn't count as stash! 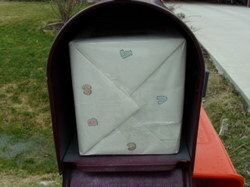 What's in my mailbox? Really, again!?! Sure enough, I have a WONDERFUL Secret Pal! A few days ago she wished me a "fetching" week. I tried not to think about it, but was pretty sure that it meant that something related to Knitty's Fetching might be on it's way. OR, it was a hint. I'll admit, when she commented, I checked to see if the designer of Fetching and Cozy were the same. Who knows, maybe my Pal is involved with Knitty. Or, maybe she's a fan. Sure enough, a fetching parcel indeed! The pattern and the yarn to make them with. The weather has turned to the chilly side again, so these may just be this weekend's project. I love the notecards my Pal has been sending! Isn't the sheep stamp great!?! 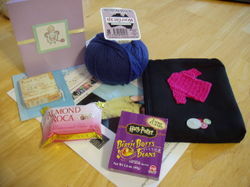 In the black pouch were the postal tape measure, an Almond Roca bar (yum) and some Bertie Botts jelly beans. Obviously, my Pal has also figured out that we are big Potter fans around here. You scored as Albus Dumbledore. You are very wise, observant, and analyctical. You have a very "well-organized" mind, which makes you function in a calm and fair manner. Though you get angered easily, its rare of you to ever act out of temper. You are constantly seeing the good in people and are naturally forgiving because of it. You're easy to please and a great person to learn from. Very cool! Thanks Pal for being so Intuitive! Have a Cozy, Fetching weekend my Wonderful, Woolie, Washington SP! Funny how going out of town and having two kids on spring break puts a crimp in routines. However, I have managed to put together a few links for you. I haven't been to a Major League baseball game since 1980! Along comes Stitch N' Pitch: an evening dedicated to stitchers of all sorts to get out to the ballpark. I'd heard of it last year, but there wasn't a game in my area (or I missed it...I don't remember). This year, the Brewers will play host July 31st. Let's see a show of hands...who's interested in a trip to the ballpark? Saturday is the final day for sign-ups for Knitters Treat. This will be the first exchange that I've seen that is being organized on another continent. Should be loads of fun. For those of you wondering, Alison's baby is getting bigger and that means that Sockapalooza 4 is right around the corner. I am still bubbling about last year's event and am looking forward to this year. It was such a wonderful time! This weekend I'm looking forward to playing with color while catching up a Brit knitting podcast I just found. And don't forget, Sunday is April Fool's Day...need an excuse to wear pajamas all day or cook up "foolish" food!?! Whatever you do with your day...HAVE FUN!!!! Mom: "You wanted photos of your missing socks." Ohhhh. I don't remember much about the socks on the left. The fact that they have a baby cable rib "Identifies" them as being a 2004 creation. That's when I attended Beth Brown-Reinsel's Gansey class. 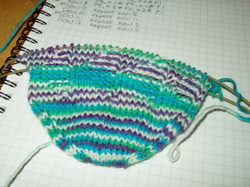 She demonstrated baby cables (aka mock cables) and I was hooked for a few projects thereafter. I'm guessing Christmas 2004. The pair on the right, I remember clearly. My grandmother wanted a pair of "house socks". I knit her a pair and found that I had SO much Opal (Petticoat #1290) leftover that I knit a second pair for Mom. I think I gave them each their pair for Mother's Day 2004. Now that I think about it (actually, I'm digging through the leftover stash), I knit the Mother's Day socks first and loved Opal so much that I used a LOT of it that year. Three years later, these socks have held up fabulously. I've said it before; Germans sure know how to make good sock yarn! The socks on the kitchen table included the green pair I knit for Mom while on our European trip last year and the test pair of my Picot Cartidge design, plus a pair from ANOTHER knitter. This morning, I was excited, the weather was unusually warm and I knew EXACTLY what to wear to work (a rare occurance for me) WITH my new, black dress shoes. I got dressed and just as I was ready to fly out the door, ripped open the box to throw on my shoes, pulled the paper out of the toes, placed them on the floor, and as I was about to step into them, looked down and noticed that I had two left feet: the shoes...not me! Panic...what would I wear on my feet. Relax...the old pair hadn't made it to the garbage yet. Phew...crisis averted. At lunch, I got the right shoe. Thankfully, my shopping this past weekend wasn't as much trouble. Tofutsies for me (did you think I'd come home without sock yarn!?! ), and a cat tape measure for one of my pals. Several Vermont FIber Designs patterns (101, 144, 146, and 160- Garter Rib Vest which seems to be SO new that it's not even on their site yet- it's the pink vest in this photo) all made their home with me. The designers at Vermont Fiber are so smart...their designs are sized XXS-7X! I was surprised to see a copy of Charlene Schurch's Mostly Mittens at one vendor location. Though the "jacket" was a bit tattered, I didn't even squawk at paying full price ($21.95) since it is currently selling for $195 on Amazon! Reynolds Soft Sea Wool Steppin Out had a number of sock patterns for men's socks. I picked it up to go with the Doogie's Online Supersocke Cotton Beach (color 945). However, I didn't manage to find yarn to knit Isabelle and the stole I'd wear with it. Now that my "two left feet" are corrected, maybe I'll have time to do some online shopping! We had a great weekend in Madison. Saturday's Knit-in was great. In the morning, the "Mitten Thumbs" class is where you could find me. I learned a few new tips in class, but the highlight was the women I met and the laughs we shared. My Mom often uses the quote "ages and stages" to describe the differences in priorities at different stages in our lives. One 40+ woman described her recent dating experience. They were starting to get serious when she invited him back to her place to see her....stash! Dirty little secret. She knew that if he could accept her yarn habit that he was a keeper. Twenty years prior, she might have shown him some other secret obsession. 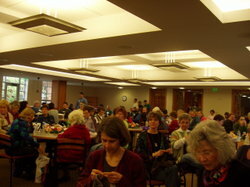 The Knit-In was well attended. This room full of women is waiting to hear whether or not they have won a door prize. There were almost 100 door prizes! I was even lucky enough to come home with one. There was shopping as well. Unfortunately, there are no photos of my plunder...yet...tomorrow...I promise. One note: Doogie was intent on purchasing sock yarn for his next sock project. Apparently, he wants to have his own stash and not raid mine. Talk about your keepers!?! No, I haven't figured it out but, I did get a parcel ALREADY! Not one, but two kinds of wool. Four balls of Baby Star red yarn with a pattern suggestion for Cozy. 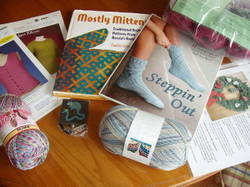 To help me stay "cozy" she also included chocolate covered cherries, blueberries, & strawberries (yum) and french vanilla cappucino mix along with two skeins of Elann Sock It To Me in Puzzle for socks for my tootsies. Thanks for everything! the handwriting is feminine (sorry if you aren't!). The return address is Washington state. That could be real, but it could be an attempt to throw me off. If it's real, I'll need to plan a trip in the future, to meet the "west coast" bloggers, including Yvonne and Chrissy. Pal either has large feet like mine (though mine are still larger) or she knows another female with "full-sized" feet. 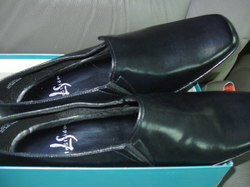 I also found the company intriguing...Simple Shoes. They have some really neat shoes. I am going to spend a little time shopping their site the next time I need some casual shoes...that could be very soon. Hard to believe it's Wednesday already! 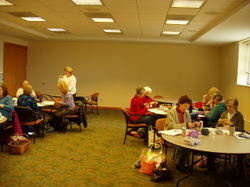 The week is flying by...fine by me since this weekend is the Madison Knitter's Guild Knit-In. There will be shopping. But, for today, on with this week's "news of the web". Now that St. Patrick's Day is past (and Mother's Day for the UK readers), it's time to start planning for the next spring holidays. To help...how about some Peeps!?! I have a bunch of leftover cotton chennile that may end up as these sweet peeps for basket fillers. Though, for KC, eyeballs are optional! or would I!?! The Scrap Sock KAL would be a great way to use up the scraps that are around the house. Come on, I've yet to meet the knitter who throws away their leftovers when they finish a project...any project! While we're on the subject of socks...Favorite Sock KAL would be a great place for the patterns to use up your leftover sock yarn to make 52 pairs of socks. Phew! Someone stop me before I KAL! Had enough of joining? Instead, let's start planning ahead...the date for World Wide Knit In Public (WWKIP Day) is set for Saturday June 9th! Last year, I was a "lone knitter" and Doogie knit "on the road". This year will be different. It will also make a great contest for my SP10 group. Mark your calendars. I am currently "hooked" on toe-up socks. I love the freedom of being able to knit socks that fit my enormous, canoe-like, "longish" feet without worrying about running out of yarn. I've now tried two different heel types and wanted to check on one more before choosing my favorite. 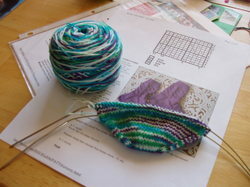 Knitty has published several toe-up socks. Diamante not only is toe-up, but it's designed for larger feet. Cool. Through some kind of fluke, there are currently 4 skeins of Lorna's Laces Hawaii in my stash (2 different dye lots or I'd attempt knee socks). Sooooo, the sock headed to the frog pond and I headed to the drawing board. Known: 7 sts per inch, size US0 (2mm), need 64 sts for a foot with 9-inch circumferance. Now to write up another pattern. The last one was so much fun that I hope the feeling can be duplicated. Between my stitch calendar and a trip to the library for a stitch dictionary (or five two), a new creation will pop up this week. Stay tuned.